"Music has done its share, and more than its share, in winning this war." When recalling the music of the American Civil War, thoughts turn to the martial sounds of beating drums, bugle calls, and patriotic melodies. On the battlefield and in the camps, music served as both recreation for weary soldiers, and a salve for the horrors of war. It was such an escape that sometimes, when opposing armies were near each other, the bands from both sides of the conflict played against each other on the night before a battle. It is not surprising that in October 1861, about 75% of Union regiments had a band, and music was a high priority for both Union and Confederate armies. But the story of the American Civil War cannot be told only on the battlefield. On the home front, where families were surviving without husbands and sons and the struggle for the freedom of all people continued, music played an even more important role. It celebrated the ties of family, supported a hope for better times, consoled endless sorrow, and inspired the ideal of freedom. From the delicacy of "Weeping, Sad and Lonely," to the raw power of "Windham" and the enduring message of "Oh, Freedom," these songs were truly the music of the people. They emanated from quiet parlors, rang from plantation praise houses and country churches, and were chanted in the field and farmhouse. And, they rose from bloody battlefields and transcended the misery of the slave quarter. As these spirituals, ballads, hymns and folk songs were shared—from soldier to soldier, slave to master, and between friends and family—they influenced one another, giving shape to a new, uniquely American music. 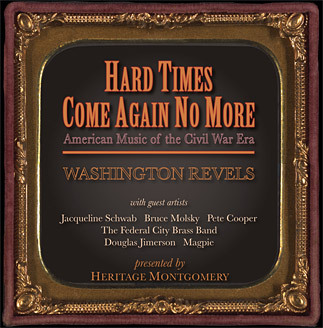 It is this unique collection of musical styles that inspired Washington Revels and Heritage Montgomery to produce this new compilation of American music of Civil War era—in honor of the sesquicentennial of this war and as a companion to the new documentary film, Life in a War Zone: Montgomery County during the Civil War 1861-1865. Though a product of its time, this music still strikes a chord that resonates in us all a century and a half later. It paints a portrait of those who sought peace, beauty, justice and freedom in the midst of a war that was said to have cost 618,000 lives. It chronicles a journey of people—white, black, Union, Confederate, enslaved, and free—whose lives were swept in the violent winds of a conflict that changed their lives, and our nation, forever. Joining Washington Revels Heritage Ensembles, Brass Quintet and String Band on the recording, are guest artists, Jacqueline Schwab, Bruce Molsky, Pete Cooper, The Federal City Brass Band, Douglas Jimerson, and Magpie. This CD recording, and its companion documentary Life in a War Zone: Montgomery County during the Civil War 1861-1865, were produced with generous support from The Maryland Heritage Areas Authority.